Soaring Event on June 6th & 7th! Not sure if there are any openings left, as I received this last week when I was away, but I thought it worth forwarding. "I just found out about a Soaring Event on June 6th & 7th here’s your chance to take a 20 minute – free ride in a glider. Freedom’s Wings International is a non-profit organization, which provides the opportunity for persons with physical disabilities to fly in specially adapted sailplanes. The event will be hosted by the Philadelphia Glider Council at their airport in Hilltown, PA located approximately 40 miles North of Philadelphia. Interested participants should call the toll free number to reserve a time slot for a 20-minute ride. There are only a limited number of flights available so call now if you want to experience the thrill of soaring. Those interested should check out our website at http://www.freedomswings.org especially the Member Experiences tab. There are only a few slots left on Sunday the 7th so if you’d like participate call the Richard Fucci, President of Freedom's Wings International (800) 382-1197 & leave a message he will get back to you in the evening." I just signed up for this on Saturday, June 5th at 5PM. There is a cookout that afternoon. So I plan on driving down and arriving early afternoon. Attached is what they sent me. They have one more slot open as of this morning. Thank you Susan and welcome back! Susan, thanks for posting this information! I called last night and I was very lucky to get the last spot. I am flying on Sunday the 7th at 1PM. Can't wait! What an incredible experience it was. It was an absolutely perfect day for flying! It is so peaceful up there, without the sounds of an engine. All you hear is the wush of the wind. It is truly floating on air. Thanks so much to Freedom's Wings and the Philadelphia Glider Club for the opportunity to enjoy a beautiful day up in the sky. They are both amazing groups! 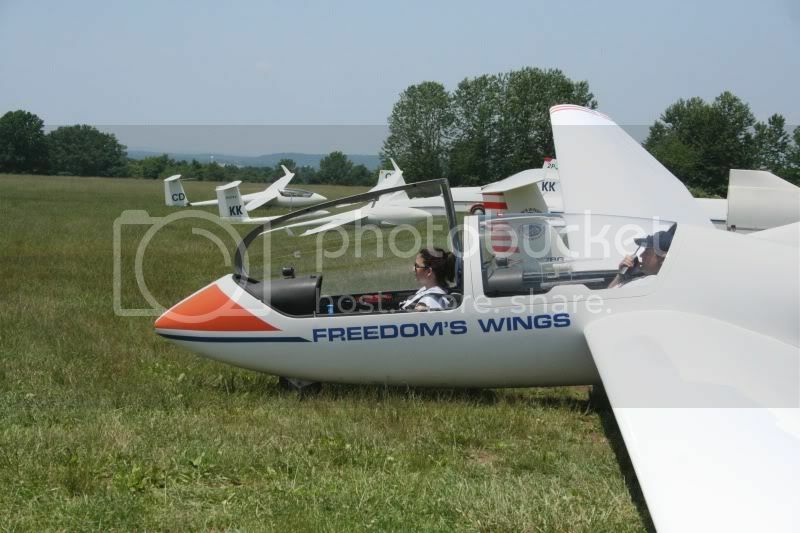 Here are a couple of pics of me in my glider. Wow Chrissy!! Thanks so much for sharing your pics with us! Very Cool!